Unit type is a group of accommodation units (rooms, apartments) that have the same rates, usually are decorated similarly and they share availability. For example, if your property has 3 apartments with one bedroom that are similar (the furniture is similar, they accommodate same number of guests, and they all have the same rates) you will create a Unit type called One-Bedroom Apartment and you will assign 3 Units to it - Apartment 1, Apartment 2, Apartment 3. The same logic is applied to hotels with different bedroom types. Your one Unit type could be Junior suite, Double Bedroom or Twin bedroom and you can have numerous Units allocated to each of these Unit types. To access these settings open Property settings then select Units and rates. To add a new Unit type select Add new unit type. Note: unit type names do not have to correspond to the room type names on online sales channels. Clicking on Edit unit type opens unit type settings. You can rename the unit type, delete it (if needed) but most importantly, here you will assign units to this unit type. Once you have named your units and arranged their structure, next step is to set up their price and availability. Note: Airbnb is somewhat different because it doesn't allow you to create unit types to which you can assign your units. Instead, you advertise your Listing on Airbnb which is a unit itself. For this reason pairing Airbnb and Rentlio is done on higher level where Listing = Unit type. 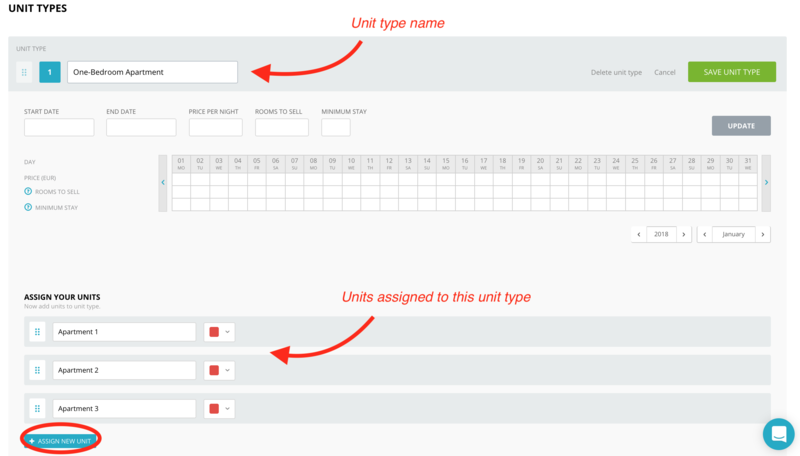 This means that for each Airbnb Listing, you have to create Unit Type in Rentlio and assign at least one Unit to it.